A little while ago I mentioned a piece of mine had been published in the June issue of Speculative Grammarian. Well, that linguistics satire piece has prompted a similarly satirical response. In the July issue, “Charlie Saygone” criticizes my theory of the “linguistic big crunch” and argues instead that we are headed for a “linguistic big rip.” In this hilarious article, “Saygone” suggests that I’m off my rocker. Which is probably true. In short, this article was terribly amusing. Academic linguistics (and perhaps academics in general) has an unfortunate tendency to engage in theory-wars, where each camp’s primary research consists of attacking the other. The recent satirical skirmish on the fate of the linguistic universe is a nice break from real theory battles. 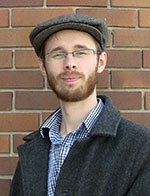 Check out my article “The Linguistic Big Crunch” here and see “Charlie Saygone’s” response here. [Incidentally, I’ve heard word that a number of other spin-offs from my article are on the way. ] Man, when someone writes the book on satirical linguists I better be remembered as the father of Cosmological Linguistics. Still, the topic is an interesting one, and one that Christians shouldn’t avoid talking about. Should we stand on the assumption that God hasn’t created life on other planets? And if he has, what theological implications would that hold for us? When “creation was subjected to frustration” because of the Fall, did mankind drag down non-sentient life in other parts of the galaxy? Of deeper import, I think, would be the discovery of other sentient life in the universe. Did death enter their worlds because of sin in ours? Today we know that the worlds outside our world are filled with what we might call “natural evil”. Stars die out, asteroids crash into planets, and so on and so forth. It would be difficult to believe in Lewis’ “Silent Planet” in any literal sense of the expression (though perhaps we could imagine L’Engle’s spreading “darkness”). But the question really becomes whether evil (natural or otherwise) in the universe can be blamed solely on humanity; it would certainly seem unfair if other sentient, sinless beings were made to suffer for mankind’s sin. Now, if Christians have the Word of God and are anointed by him, they are in duty bound to confess, preach, and spread this Word. It is as Paul says in II Corinthians 4 [:13], “We have the same spirit of faith, and therefore we speak.” The prophet says in Psalm 116 [:10], “I believed, therefore have I spoken,” and in Psalm 51 [:13] he says in the name of all Christians, “I will teach transgressors thy ways, and sinners will return to thee.” These passages prove once more that a Christian not only has the right and power to teach God’s Word but is in duty bound to teach it on pain of losing his salvation and forfeiting God’s favor. I reply: Here you must consider the Christian from a double point of view. On the one hand, if he is in a place where there are no Christians, he needs no other call than the fact that he is a Christian, inwardly called and anointed by God; he is bound by the duty of brotherly love to preach to the erring heathen or non-Christians and to teach them the gospel, even if no one has called him to this work. That is what St. Stephen did (Acts 6 and 7); the office of preaching was not committed to him by the apostles, yet he preached and performed great wonders among the people. Philip, Stephen’s fellow-deacon, did the same (Acts 8 [:5]) without having received the office of preaching. The same is true of Apollos (Acts 18 [:25-26]). In such circumstances the Christian looks in brotherly love on the needs of poor, perishing souls and waits for no commission or letter from pope or bishop. For necessity breaks every law and knows no law; moreover, love is bound to help where there is no one else to help. On the other hand, if a man is in a place where there are other Christians who have the same power and right that he has, he should not thrust himself forward but should rather let himself be sought out and called to preach and teach in the stead and by the commission of the rest. Even among other Christians a Christian has the right and obligation to get up and teach without being called by men if he should find the teacher in that place to be in error, provided that this is done in a becoming and decent manner. Such a case is plainly described by St. Paul in I Corinthians 14 [:30], where he says, “If a revelation is made to another sitting by, let the first be silent.” Notice what St. Paul does here. He commands the man who is teaching to be silent and to step aside (among Christians!) and commands the hearer to speak up, even without a call, because necessity knows no law. …In the same passage St. Paul gives every Christian the right to teach among Christians whenever it becomes necessary: “You can all prophesy one by one, so that all may learn and all be encouraged” (I Corinthians 14 [:31]), and, “Desire earnestly to prophesy, and do not forbid speaking in tongues; but all things should be done decently and in order” [I Cor. 14:39-40]. Take this passage as a very sure ground which gives more than sufficient authority to the Christian community to preach, to permit men to preach, and to call preachers. Especially in case of necessity this passage itself summons each and every one without any call of men. A powerful passage, no? It is certainly helpful in clarifying the meaning of Article 14 of the Augsburg Confession : “Our churches teach that no one should publicly teach in the Church, or administer the Sacraments, without a rightly ordered call.” There are occasionally instances when any Christian must by necessity preach. It would be a very lucky North American Christian who has never run into the Jesus Junk phenomena. You know what I mean: that cheap garbage which populates the shelves of your local Christian bookstore, stuff traditionally used as “prizes” in Sunday School and Vacation Bible School programs. Pencils, erasers, yo-yos, frisby-type toys, etc. Today, this nonsense extends to t-shirts, coffee-cups, and so much more (If you need a refresher, you can see some examples of Jesus Junk here). Now, it seems to me that much (if not all) of this material is obviously empty of real spiritual value. Jeff Dunn has an excellent article on the subject over at the Internet Monk website. In addition to talking about Jesus kitsch, he discusses how many of the books (even Bibles) in Christian stores are similarly being emptied of their spiritual significance. You should go read his article. Now. 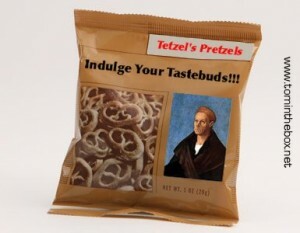 A friend of mine, who used to run the brilliant blogsite Credo Ut Intellegam (and who – just in case he’s reading this – should hurry up and resurrect it), once suggested that he and I should start a company to sell “Tetzel’s Pretzals” with catch-lines like “Salted with the Fires of Hell” and “Indulge Yourself.” Of course he was parodying the Jesus Junk phenomena. But the joke draws an important parallel – the sale of indulgences was a waste of money providing no real spiritual benefit. Too much of what is being sold in Christian stores today is similarly low on spiritual content. Put bluntly, it’s junk food. And a steady diet of Christian junk food will lead inevitably to spiritual malnourishment in churches across North America. Captain Thin is powered by	WordPress 5.0.4 and delivered to you in 0.396 seconds using 31 queries.